: I won't go into a lot of history as the P-40 was one of the most prolific of all World War II fighters and has been well-covered by a number of good publications and websites. 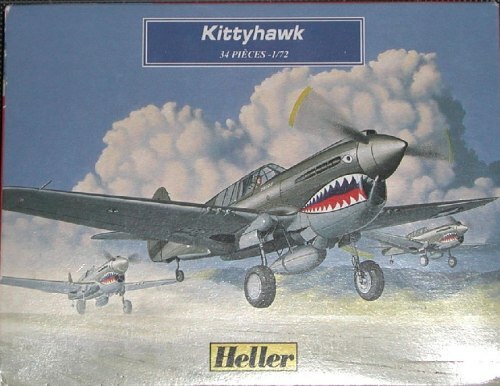 I will say that the variant kitted here, the Kittyhawk, was the export version of the P-40E. According to the USAF Museum's website, 2,320 P-40Es were built. My son picked out this kit at a local hobby store with the idea that I would build it for him. Since it was cheap and had neat box art, I was amenable to his suggestion. I regretted the decision as soon as we opened the box. This kit has 34 pieces of medium green styrene with lots of rivets and raised panel lines. The moldings are old and by no means flawless, but they aren't bad, either. The biggest drawback I found was a particularly nasty sink mark in the left fuselage half. Detail is very basic. The cockpit consists of a seat for the included pilot while an awkwardly molded external fuel tank provides your only option. (I say "awkward" because assembly involves trapping the attachment braces between the horizontally split fuel tank halves.) When developed, Heller engineered the kit so that it could be built with retracted landing gear (pegs for the wheels are molded into the upper wings), but the instructions do not address that option. The fold-out instructions are printed in color and are very easy to follow-perfect for the young builder. 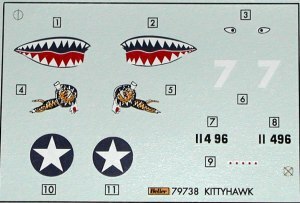 Decals are provided for Col Robert L. Scott's aircraft in China in 1942. The decals look nice until you use them (since I'm actually building the kit now I can add that). They are out of register and will resist being applied over the rivets. You can replace them with lots of aftermarket options, but then you are really wasting your money. In the end, my son will be very happy with his airplane. He won't care about any of the imperfections and will be ecstatic when we hang it in him room. Still, he's only three. The detailing on this kit is very basic and a great deal of work will be required to get a nice fit. 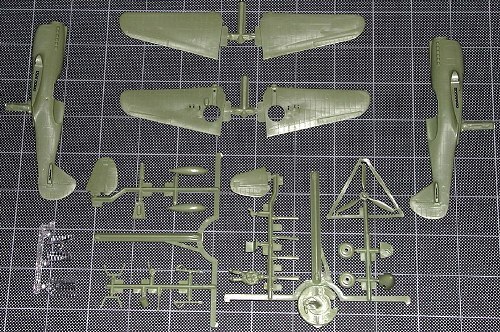 If you have any interest in building a P-40E, start with either the Hasegawa or Academy kit. Both are much nicer and neither is that much more expensive. If you have this kit, pass it on to a youngster (or better yet, help them build it) and go for one of the other manufacturers' releases. You'll be glad you did.